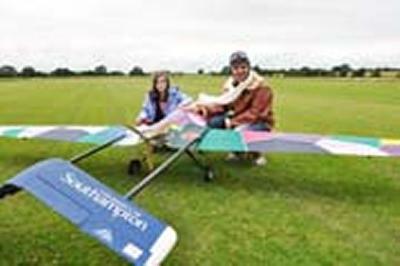 Blue Peter has announced the winner of its competition to name and design the livery for a new remotely operated aircraft, built by the University of Southampton, which the BBC may use to capture aerial TV footage in the future. Izzy Bennett, 11, from Exwick in Exeter produced the winning name, the ‘iflyer’ and the winning graphic design, and was presented with her Blue Peter badge and replica plane by Blue Peter presenter Barney Harwood. The plane, designed by University staff and students, has been developed in collaboration with BBC Research and Development over the last few months, to equip an “unmanned aerial vehicle” (or UAV for short) with broadcast cameras. BBC R&D has developed new technology for the UAV to enable filming, with improved shot stability and accuracy, for its news, sport and documentary programmes. They have also provided the capability to stream live HD footage directly from the aircraft to a computer in real time. The petrol-powered plane, with a 4.2m wingspan, has a top speed of 42.5mph and can fly for two hours with a maximum fuel load at an economic cruise speed of 24.5mph. Key parts of the plane were built using Additive Manufacturing – or 3D printing – by 3T RPD and 3T’s workshop converted Izzy’s winning graphic design into reality by painting the livery on to the plane. 3D printing works by converting 3D CAD engineering drawings into solid objects from nylon powder using laser melting. The object is built, layer by layer, with each layer the thickness of a human hair. It allows designers and engineers to create complex and lightweight parts rapidly. A number of parts were built for the Blue Peter plane including the nose cone, main fuselage, the camera housing, tail fin and the wing tips.